J.A. Henckels is a Solingen, Germany based knife manufacturer that dates back to 1731. 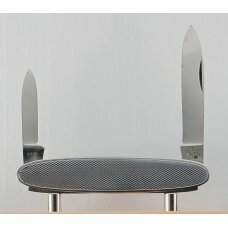 The company's Zwilling (twin) logo is known to be one of the oldest trademarks in the world. 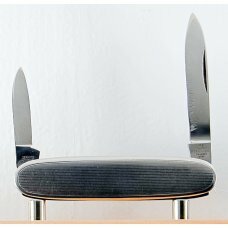 Throughout the company's history, it has made some of the world's finest pocket knives, kitchen knives, scissors & flatware. In 1960 Henckels ceased their pocket knife production and started having other companies make knives for them on contract. 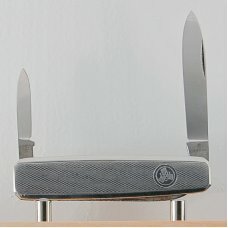 Boker has been one of the main producers of more recent Henckels products. J A Henckels Stockman Knife w/ Great GunStock Walnut Handles - NOS in Orig Box with gold foil lettering +leather pouch & COA. Never used, carried or s.. FANTASTIC Antique J A Henckels Friodur, 3 Blade Push Lock Large Hunter +Corkscrew with NICE! 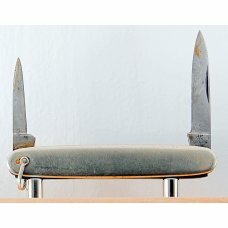 Stag Handes - skinning or camping knife. Great snap on op..
Vintage J A Henckels Natural Smooth Bone 4 Blade Congress Pocket Knife w Red Shield MDL# HK-1-WSB. NOS - Never used, carried or sharpened. Please see ..
Vintage J A Henckels 2 Blade Canoe w/ Great Stag Handles & Blade Etch - M/NM -NICE ONE! Vintage J A Henckels 2 Blade Canoe with Great Stag Handles & Blade Etch - M/NM -NICE ONE and hard to come by. The stag handles are nicely matched and ..
Vintage, NOS, J A Henckels 4 Blade Congress Knife w/ Nice Stag Handles with Red Shield and step down bolsters. Never used, carried or sharpened. NM/M ..
Vintage J A Henckels 2 Blade Trapper (HK5-GSW) Pocket Knife w/ GunStock Walnut Handles -COA & Box with box slip cover. The model # is HK5-GSW. It meas..
Paul Henckels, Camp knife w Green Synthetic Handles, Fork, Blade & Bottle Opener -NOS in Orig Box. - Light handeling markings from being admired. 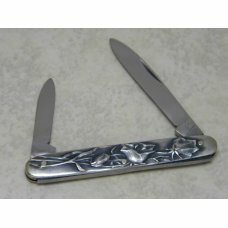 Nev..
Vintage 1960s to early 70s J A Henckels 2 Blade Gentlemen's Pocket Knife MDL#79 with Great Stag Handles! NOS & Box. The blades overall have good snap..
Vintage, NOS, J A Henckels 4 Blade Congress Knife w/ Nice Stag Handles w/ Red Shield +Orig Box. Never used, carried or sharpened. NM/M condition. Ligh.. Fantastic! Vintage J A Henckels Presentation Fixed Blade Hunter with Great Deer Stag Handles & Super Blade Etch of Wolf Howling at the moon. 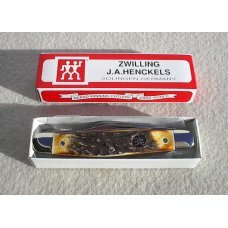 Comes as ..
Zwilling J A Henckels 3 Blade Stockman (HK-3-YP) pocket knife with Yellow Pick Bone Handles and come new in its Original Box. Good snap on open and c..
Vintage J A Henckels 6 blade Multi-use Camping Tool / Knife with Metal Handles -Nice one! Vintage J A Henckels 6 blade Multi-use Tool / Campimg Knife with Metal Handles -Nice one! Great snap on open and close and no blade wobble! The blades..
Vintage, NOS, Zwilling J A Henckels 3 Blade, Hand Forged Barlow (HK-26-B) with Premium Red Pick Bone Handles. Great open and close snap and no blade m..
J. 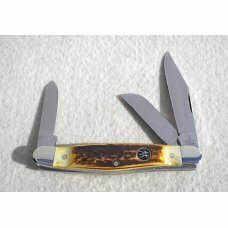 A. Henckles 4" Large Stockman knife with Genuine Stag Handles That Have No Cracks or Chips. The Knife Has Never Been Used, Carried or Sharpened. Th..
Vintage J A Henckels (Friodur) Melon Tester / Citrus Knife with Metal Handles +Original Box -NOS! Nice open and close motoion and snap. NO blade wobbl..
J A Henckels Copperhead Pocket Knife with Greenish Brown Handles +Black Shield & Orig Box -NOS. Beautiful knife! Nice smooth open and close motoion an..
Vintage J A Henckels 3 Blade Whittler Pocket Knife w/ GunStock Walnut Handles -COA & Orig Box with box slip cover. The model # is HK7-GSW. The blades ..
Vintage J A Henckels Presentation Fixed Blade Hunter Knife with Deer Stag Handles. This gem has gold scroll and Deer Running in the wilderness Blade E..
J A Henckels 4 Blade Stockman with Beautiful Dark Red Pick Bone Handles - NOS NM/M -Nice One! J A Henckels 4 Blade Stockman with Beautiful Dark Red Pick Bone Handles - NOS NM/M. Nice one to use or put up and admire! Some markings from being han..
J.A. Henckels Red Bone Trapper Pattern # HK5-B New in box never carried or sharpened Nice Red Bone handles with no chips or cracks no half stop , no..
J. 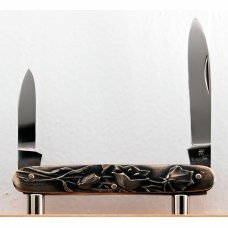 A. Henckels 3 Blade Barlow knife with Beautiful Genuine India Stag Handles That Have No Cracks or Chips. The Front Bolster is Stamped in Red with ..
4 1/8" premium stock knife perfect stag handles, never used carried or sharpened stock snap with smooth action on all blades..
J. A. Henckels 1 Blade Barlow knife with Beautiful Genuine India Stag Handles That Have No Cracks or Chips. The Blade is Stamped ( Twins Logo Zwilling..
Zwilling J A Henckels 3 Blade Whittler pocket knife w/ Natural Red Bone Handles - NOS -NM. Some markings from being a loose knife. Good snap on open a..
New in Box 2005 J. 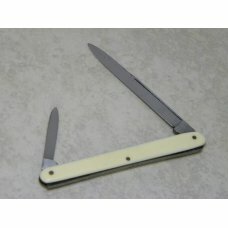 A. Henckels 4-Blade Stockman Knife in absolutely NEW MINT condition. These 4 Blade Stockmans are super hard to find, especially in..
Vintage J A Henckels (Friodur) 2 Blade Pocket Knife w Natural Bone Handles -NM & Nice Older One! Vint J A Henckels (Friodur) 2 Blade Pocket Knife w Natural Bone Handles -NM & Nice Older One! The handles look and feel to be natural bone. 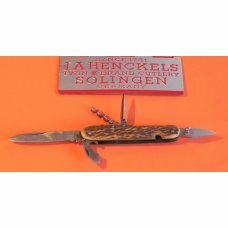 They are ..
Vintage, J A Henckels 2 Blade Trapper with Torched Natural Bone Handles w/ Black Shield - NOS +Box!. Never used, carried or sharpened. See pics for cl..
J.A. Henckels Germany Friodur Inox Metal Vine of Flowers Pen Knife - Metal Handles - No Cracks - Snaps Open and Shut - No Wobble - Very Nice Unused Co..
J A Henckels 3 Blade Stockman with Premium Red Pick Bone Handles - Nice one to use! 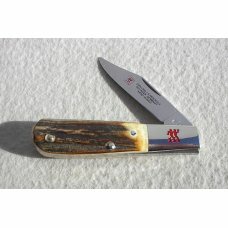 J A Henckels 3 Blade Stockman with Premium Red Pick Bone Handles - Nice one to use or put up and admire! Some markings from being handeled / cleaned a..
Vintage J A Henckels 3 Blade Stockman Pocket Knife (HK-3-S) w/ Great Super Stag Handles! NOS. The blades overall have good snap, are tight with no bla..
Up for your consideration is the following pocket knife: INVENTORY #: 957 MAKER: Henckels TOTAL # OF BLADES: 3 PATTERN: Pen LENGTH CLOSED: 2 15/16" ..
Up for your consideration is the following pocket knife: INVENTORY #: 955 MAKER: Henckels TOTAL # OF BLADES: 2 PATTERN: Pen LENGTH CLOSED: 3 5/16" C..
Up for your consideration is the following pocket knife: INVENTORY #: 950 MAKER: Henckels TOTAL # OF BLADES: 2 PATTERN: Pen LENGTH CLOSED: 2 3/4" CO..
Up for your consideration is the following pocket knife: INVENTORY #: 949 MAKER: Henckels TOTAL # OF BLADES: 2 PATTERN: Pen LENGTH CLOSED: 2 13/16" ..
Up for your consideration is the following pocket knife: INVENTORY #: 948 MAKER: Henckels TOTAL # OF BLADES: 2 PATTERN: Pen LENGTH CLOSED: 3 1/16" C..
Up for your consideration is the following pocket knife: INVENTORY #: 934 MAKER: Henckels TOTAL # OF BLADES: 2 PATTERN: Pen LENGTH CLOSED: 2 3/4" CO..
Vintage J A Henckels TwinWorks (Graef & Schmidt - J A Henckels USA Agents) Straight Razor with Logn Arm Twin-Men -Light use if any. Columbus Handle Ar..
Vintage J A Henckels 2 Blades +Scissors Gentlemens Pocket knife with Decorative Metal Handles +Orig Box in M/NM condition, NOS -Light handeling markin.. Antique J A Henckels (Friodur) 5 Blade Folding Hunter/Camping Knife with nice flawless STAG Handles +Long ARM twin-men stamp indicating this is a very..
Vintage J A Henckels (3) Wood Carving Tools / Chisels in good used solid condition - They are ready for use... 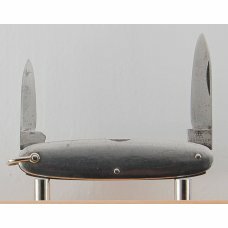 They do have patina spots on the metal ..
Vintage J A Henckels (Long Arm Twin Men) 2 Blade (Main Blade and File Bl) Fake Pen Knife -Rare! Vintage/Antique - J A Henckels (Long Arm Twin Men) 2 Blade (Main Blade and File Blade) Fake Pen Knife -Rare!. Solid one to use or to put up in the sho..
Paul A Henckels Hobo -H1o new in box never toted or sharpened . Very Nice Red Bone handles that are chip & crack free . Made in Solingen Germany. Very.. Antique J A Henckels 2 blade +File whittler model pocket knife. Handle looks to have a hairline - see pic 3. Great snap on open and close and no blade..
Old J A Henckels Carving set that consists of 1 Carving Knife & 1 Serving Fork, both with Gorham Sterling Silver Handles - Very Light markings for be..
Vintage J.A. Henckels Germany Smooth Composition Slimline Pen Knife - Smooth White Composition Handles - No Cracks - Brass Liners - Snaps Open and Shu..
Vintage J.A. Henckels Germany Red Model: 1813 Stockman Knife - Red Composition Handles - No Cracks - Nickel Silver Liners - Snaps Open and Shut - No W..